BIOnight are a two man sound experimentation machine, and collectively, as well as solo, they have been progressively producing and creating excellent electronic synthesized music for nearly a decade now in their native Italy. Sbrizzi Fabio and Mac, as they are also known, create cinematic soundscapes, here on Back to Orion, reminiscent of those early German pioneers Tangerine Dream, Klaus Schulze, Hans Joachim Roedelius, and many more. 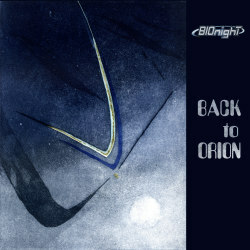 Back to Orion is their seventh release and it offers seven tracks lasting just over fifty minutes. The sound is ambient in its essence, sequential in its form. It is earthy, spacey, hypnotic and journeying. It flows enchanting, evolving and devolving through frequency and vibration, through time and space, and in my opinion, it is necessary listening for any lover of electronic music. From start to finish, we are immersed in colourful electronics that pump new life and fresh blood back into the veins of the aforementioned pioneers. Each track weaves seamless to the next and each new phase is relevant to the former. The ride is modern and vibrant, energy driven, and powerful, and it spiritually captures, overall, a Cyclone era Tangerine Dream feel, which is executed with craftsmanship, quality and passionate emotion. It is well worth investigation on the part of headphone experimenters and synthesizer adventurers. You will not be disappointed.